228 bottles, Distilled: 12/12/1984, Bottled: 12/12/14, matured in a hogshead. Wow, this is exactly 30 years old, to the day! Which means that if it were a woman, it would officially be too old for me to date. I could bore you with the details, but this is one of the best malts I've ever tasted. I would have guessed it was a sherry cask based on the heavy fruit notes. Unlike a lot of other old Caol Ilas, this one is still a peaty bruiser, with concentrated lemon oil, herbs and heavy cigar smoke. 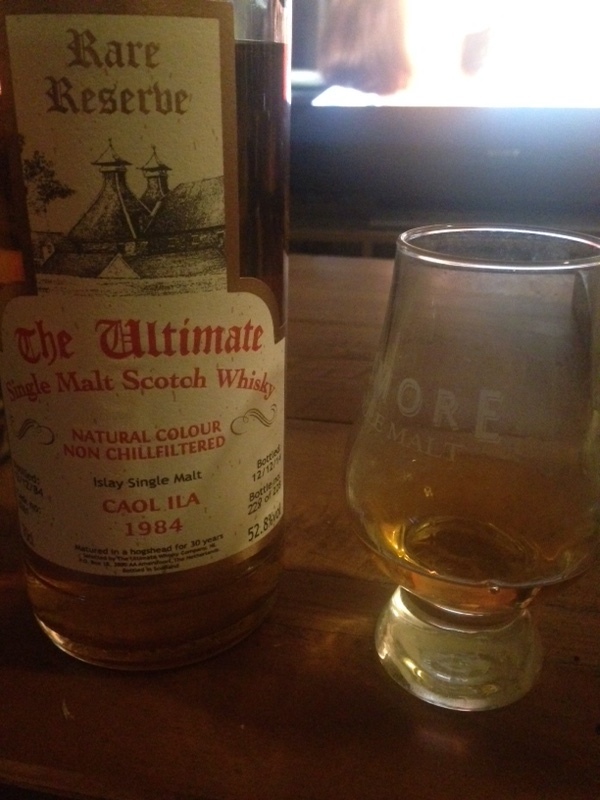 It's lively as hell, exploding with more peat in the finish, but everything integrates perfectly. Can't find a flaw...which is rare for me, because I'm happy to point out the deficiencies in my friends, family, and readers. 93 pts/A. Serge Valentin (adore him) gave it a 90, but it's better than that. Classic in every way, just like me. Among the best spirits I've ever tasted. It's Brora/Port Ellen level, really.